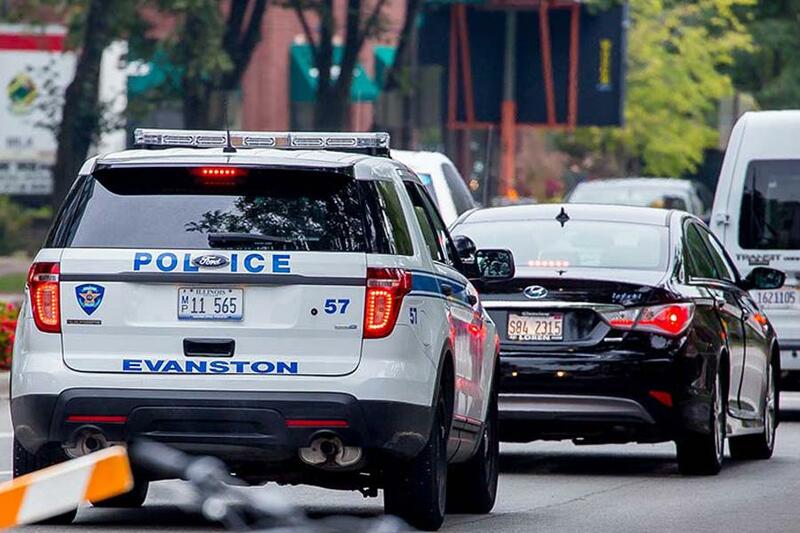 The Evanston Police Department has pledged to change policy after two contentious arrests, one which gained national attention. Still, some community members say change will be a daunting task. Northwestern graduate student Lawrence Crosby left his south Evanston apartment one night in October 2015. He approached his car, a black Chevrolet, with the intention of driving to campus, but soon noticed a piece of molding dangling from the driver’s side door. As he took to the damage with a metal bar, he noticed a woman watching. He decided to ignore it, finished the repair and began to drive. When he heard sirens, Crosby promptly pulled over, unaware that the woman had just called the police to report a car theft after observing him at work. Crosby stepped unprompted out of his car, hands over his head, ready to clear up any misunderstanding. But he never got the chance. “Get on the ground!” officers shouted at him, lights flashing and sirens blaring. Crosby tried to speak, but five officers rushed forward and slammed him to the ground — kneeing and punching him during the takedown. On Jan. 12, police released a video of that arrest, sparking a debate over proper procedure and racial bias in Evanston. “Disturbing doesn’t do justice to the impact of watching that,” University President Morton Schapiro told The Daily in an interview. Despite Evanston’s reputation as a progressive city, some community members say that police unnecessarily escalate routine scenarios and treat minorities differently. Adding to the equation is another recent arrest — in which Devon Reid, a city clerk candidate who is black, was arrested while petitioning in downtown Evanston — that has prompted city officials, residents and police to call for change. But for some Evanston residents, that is a daunting task. Mayor Elizabeth Tisdahl said Chicago police would “love to have the problems we have” and called any comparison between the two “ill-considered.” But, she added, Evanston does have a “cultural problem” concerning race, as do most cities across the country. Police Chief Richard Eddington, however, said he does not believe EPD has an issue with race. Among some members of the Evanston community, there is deep-seated distrust for the police. A few residents who spoke with The Daily even said they would pause before dialing 911 for fear of escalating an incident and unduly harming an innocent suspect. Freise pointed to Crosby’s case, which has led to a civil lawsuit against the city and has drawn national attention. Eddington acknowledged the outrage raised by the video and said an apology for Crosby was “not beyond the realm of possibility.” But he disputed the perception that Evanston police had a unique problem with escalation. Betty Ester, a 5th Ward resident who has lived in Evanston for more than 30 years, said tension between EPD officers and minority communities isn’t new. For years, she said, police have unreasonably escalated minor interactions and used diversity among their ranks as a guise for unequal policing. After the arrests of Crosby and Reid, Eddington said he has been working with city manager Wally Bobkiewicz on policy changes. He said those changes would be presented at a Human Services Committee meeting on Feb. 6, but declined to share any further details. Among U.S. police departments — most of which don’t demographically reflect the communities they serve — Evanston is unique. Black officers make up roughly a quarter of the police force, compared to 18.1 percent of the city’s total population. Across the nation, a wave of government reports have criticized police for excessive force, racial bias and lack of internal oversight. In Chicago, a recent report released by the Department of Justice found that officers “engage in a pattern or practice of using force … that is unreasonable,” citing examples of force predominately aimed at people of color. After that report, Mayor Rahm Emanuel called the findings “sobering” and pledged change. Evanston’s mayor has responded similarly to these recent incidents. While Tisdahl said that policing is a “very difficult job” and that Evanston police were generally better than Chicago’s, she said race “was probably a factor” in the cases of Crosby and Reid. Cicely Fleming, who is running for 9th Ward alderman, said arrest rates and contact cards — which document police stops — for black people are typically high. According to Evanston police data from 2015, black people make up 61 percent of arrests and 73 percent of contact cards. Next month, officials say they will reveal policy changes that include limiting the number of officers who give commands to suspects and no longer requiring suspects lie flat on the ground during stops. Some community members were frustrated by the delayed action, which they believe was prompted only after recent incidents gained national attention. Tisdahl and Eddington disputed that idea. Eddington said he knew the Crosby incident would be “media-worthy” before seeing the video. Tisdahl said city officials started pushing for changes in 2015 immediately after viewing the video. Eddington said officers undergo a “critical review” of every use of force, with or without media attention. He said video recordings play a crucial role in that review. After being denied a federal grant to purchase officer-worn body cameras in 2015, EPD in October said they were working toward implementing the cameras in partnership with University Police. “When everyone realizes they’re being recorded, it will have an impact on the citizen and the officer,” he said. Ester, the 5th Ward resident, said police need to get to know the community better, pointing to a policy that allows non-residents to join the force. Ester and a group of other Evanston residents are pushing for more civilian oversight as a way to better hold officers accountable. Currently, the department’s Office of Professional Standards oversees all complaints about police, a process that includes civilian advisory. In 2016, police received 17 formal complaints out of 109,000 interactions, Eddington said. It found police wrongdoing in three of them. Eddington said he didn’t see a need for change in the current system. Nevertheless, Tisdahl said she planned to meet with Eddington and city lawyers to review the internal investigation process.